Welcome to WinterStone Golf Course! WinterStone Golf Course opened in 2003 in Independence, Missouri. It is the second phase in a development project that began with a limestone mine. Harlan Limpus, owner of the mining firm Rocca Processing, bought 150 acres of land and opened a mine there in 2000. Limpus then built a golf course on the property to enhance the value to the community in 2003. But not just a golf course, a great golf course, because the wooded setting is truly spectacular with elevation changes, towering trees, lakes and creeks combining to create an Ozarks-like feel. The course was designed by Craig Schreiner Golf Course Architects, a local firm with a national reputation. Come experience WinterStone Golf Course. 4 Person Scramble. 9AM Shotgun. $75 per Player, $65 for Stone Pass Members, $50 for Members. Pre Pay before the day of event to save $10. Includes 18 Hole Golf Fees, Golf Cart, Range Balls, Hole Contests, Prizes, Payouts, & Lunch. Session 1: June 3rd - 6th. For ages 7-15. $150/Child per Session includes: 4 days of camp - Mon-Thurs, 10AM-1PM, instruction from PGA Professionals on chipping, putting, and fundamentals of the full swing, lunch every day, games, prizes, free range punch card, & discounted private lessons! 4 Person Scramble. 8AM Shotgun. $75 per Player, $65 for Stone Pass Members, $50 for Members. Pre Pay before the day of event to save $10. 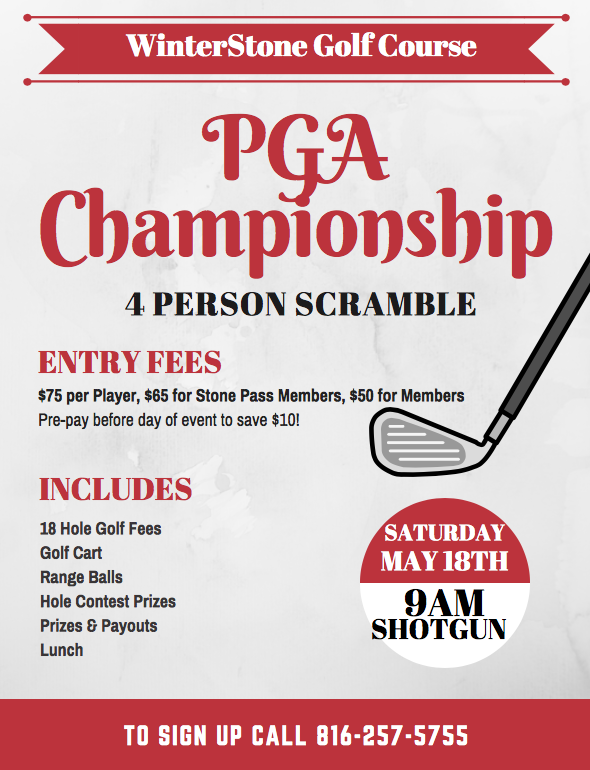 Includes 18 Hole Golf Fees, Golf Cart, Range Balls, Hole Contests, Prizes, Payouts, & Lunch.